DAYTONA BEACH, Fla. (Feb. 16, 2017) – In Bret Holmes’ 11-year racing career, he has seen a vast assortment of dirt and asphalt tracks across the United States. Those facilities pale in comparison though to the legendary Daytona International Speedway, as the Munford, Alabama native looks to kick-off his 2017 ARCA campaign this Saturday in the Lucas Oil Complete Engine Treatment 200 Driven by General Tire. Holmes, who still calls Alabama home, has come a long way from running dirt tracks across the Yellowhammer State to now running at the “World Center of Racing,” and he couldn’t be more thrilled. Holmes got a brief taste of running in the ARCA Racing Series Presented by Menards last season with a limited seven race schedule, and even though it was only a few events, he managed to put together three top-5’s, six top-10’s and an average finishing position of 8.6. And with that glimmer of success, Holmes looks for 2017 to be his break out season and set him apart as a name to be reckoned with. As previously announced, Holmes and BHR will come into this weekend on the heels of a big offseason for their newly formed ARCA team. Since the end of last season, the organization has moved its shop from Munford, AL to Statesville, N.C. on the campus of GMS Racing, who is providing technical support to the team. In addition to the move, Bryan Berry was announced as Holmes new crew chief, replacing 2015 ARCA Champion Grant Enfinger, who will be driving full-time this season in the Camping World Truck Series with ThorSport Racing. In addition to a new crew chief, BHR will tap Monster Energy NASCAR Cup Series spotter Earl Barban for this weekend’s event. Barban is most famously known for his work with defending Cup Series Champion Jimmie Johnson. Holmes will also compete for both the SCOTT Rookie of the Year and the ARCA Racing Series Presented by Menards Championship this season. 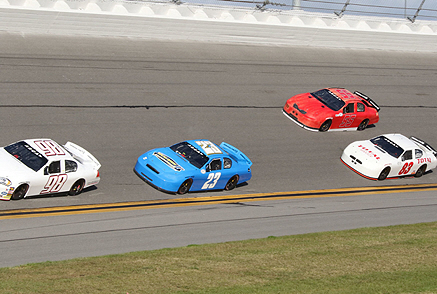 Action will start this Thursday at Daytona, with cars on-track and practice scheduled from 4-6 p.m. ET. Friday will hold a final practice in the morning with qualifying later in the afternoon. The Lucas Oil Complete Engine Treatment 200 Driven by General Tire is live on FS1 Saturday, Feb. 18 at 4 p.m. ET. Be sure to follow Bret Holmes Racing on Facebook (@bretholmesracing), Twitter (@bretholmes_2), and Instagram (bretholmes2) for the latest news, updates and photos throughout race week. About Bret Holmes Racing: Bret Holmes Racing is an Alabama-based ARCA racing team that operates out of Munford, AL and Statesville, N.C. while still holding true to its traditional southern roots. Founded by Stacy Holmes, of Holmes II Excavation in Munford, the team sticks to its good nature and solid values to put forth the best product on and off the track with its driver Bret Holmes.